There is a trend with the Jets’ bottom ranked players and that’s an absence of any offensive value, even relatively speaking for bottom-rung players. The Jets bottom of the roster provided little-to-no scoring, and Tanev is no exception. He put up four points in total while playing over half the season with the team. 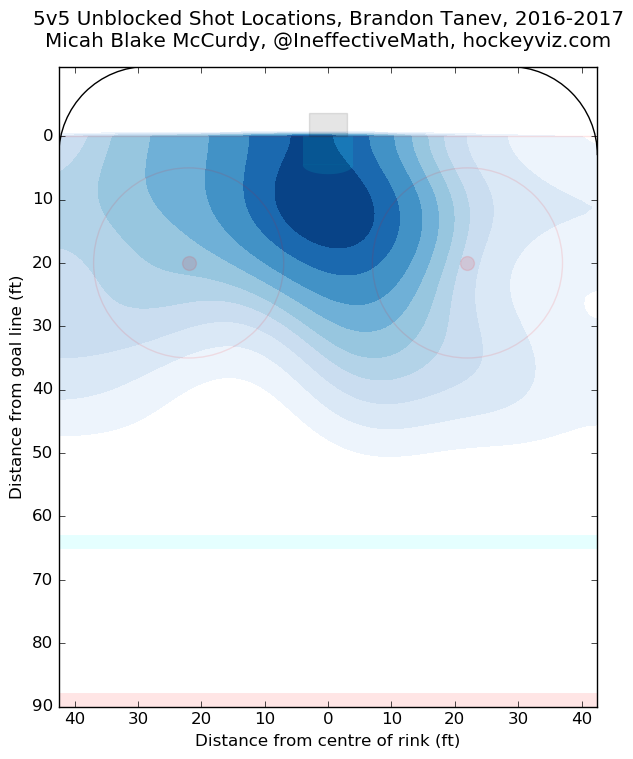 His shot volume relative to ice time and shot location selection suggests he may have been owed a goal or two. The only way Tanev provided any real value was through drawing penalties. His actual performance in terms of offense and defense at even strength was below replacement level, worse than even Alex Burmistrov. Penalty drawing is a player skill, and Tanev draws quite a few with his high-end acceleration and speed. How sustainable his pace is though remains to be seen. Tanev carried a fairly negative impact on the Jets shot differentials. The Jets allowed a similar level of shots against with Tanev on the ice, if not a tad fewer. The team’s issue came in shot production, or an embarrassing lack thereof. Expected goals suggest Tanev’s impact on shot location compounds things even worse. The speedy winger’s production relative to ice time was about half that of the average fourth line player. Tanev produced a lot of shots. While his shot location was solid (as noted above), the lack of puck movement prior to Tanev shooting limited the potential potency to his chances. Everywhere else, Tanev failed to provide any value. He didn’t pass, build up play, transition the puck efficiently from the defensive zone, or set up shots. In zone transition, Tanev’s entries had the lowest number of carry-in entries per attempt after Chris Thorburn. The part that hurt the most though was only 4.7 per cent of Tanev’s carry-in entries actually had a successful pass afterward, a team worst rating. Only Thorburn and Drew Stafford had a worse number of shots produced per carry-in entry. Brandon Tanev, like Burmistrov, represents good process without much value coming from it. Tanev was a solid college UFA that the Jets took a chance on. He cost no draft picks and pennies, at least relatively speaking, in salary. However, it seems clear that Tanev is also not a NHL calibre player. He has NHL level speed in his legs but is without NHL level speed upstairs to match. This causes his speed to be fairly ineffective in producing results, aside from drawing penalties when he is with the puck. At 25-years-old, the odds are stacked against Tanev for much change in these departments. Tanev was a solid acquisition, but appears to be more suited for the AHL than the NHL. He could still provide value in the organization as being a depth player or a 13th forward, allowing the Jets to avoid sitting young players with far more upside like Marko Dano and Nic Petan. Looking forward to seeing him play for the Moose (for hopefully all of) next season. Wow – Petan is a different person away from Tanev. That’s just sick.